Frankfurt School of Finance and Management is offering Full Scholarships for International Students. Apply! Frankfurt School of Finance and Management, Germany seeks application from prospective international candidates for the 2014/2015 Frankfurt School Scholarships. All tuition fees at Frankfurt School are waived for scholarship holders. If the scholarship are split, then a 50% tuitioin waiver is granted. Performance in the Frankfurt School selection procedure and candidates’ personal details (extracurricular activities, social commitment, intercultural skills, international experience and if relevant, professional experience, internships). Diversity and social aspect may be taken into consideration in the case of equivalent qualification. Scholarship are awarded initially for a period of two semester and are only extended if candidates perform to the standards required by the respective study programmes. 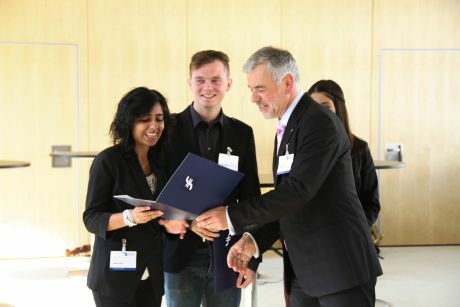 Scholarship winners are selected by a Frankfurt School Committee between March 15 adn June 15, 2014. Incomplete applications or application received after this date cannot be considered for a scholarship. The committee’s decision is final and candidates habe no legal entitlement to a scholarship.